Social Responsibility - ZETOR TRACTORS a.s.
Zetor tractors are developed with the aim of offering an elegant design and high-end-use properties with an emphasis on environmental friendliness and reducing the energy demands of our processes. Zetor aims to continuously improve environmental protection and pollution prevention, reducing the range of environmental and energy impacts caused by its activities and services, by maintaining and improving the company's environmental and energy profile. 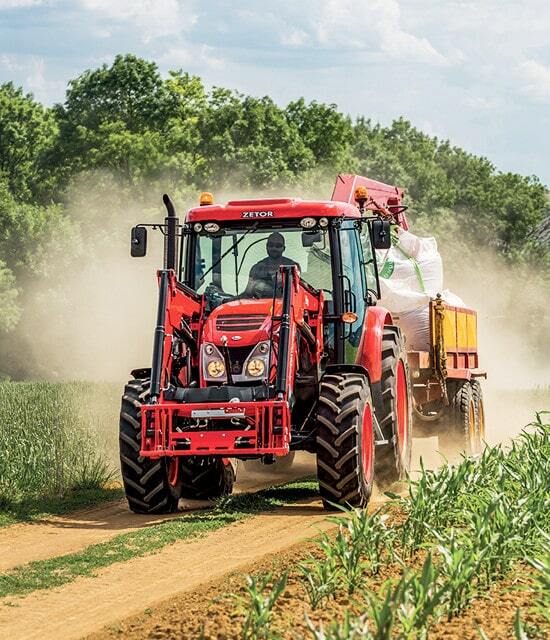 Zetor also adapts and replaces existing technologies with the aim of using environmentally friendlier materials and substances, leading to CO2 emission reduction. The company behaves responsibly in respect to the environment, not only when developing a new product, but also when manufacturing it and subsequently when it is operating with the customer's business. ZETOR TRACTOR's management considers the organisation’s environmental and energy policies to be basic priorities to achieving conformity with the relevant environmental, energy and legal regulations applied to the company. These requirements are documented, maintained and communicated to all people who work in the company, as well as external personnel and suppliers. ZETOR TRACTORS believes in high moral standards and principles, and places emphasis on compliance with legal regulations and standards. ZETOR TRACTORS shall not tolerate any unlawful, unethical or unfair conduct. Each employee is required to work to the best of their abilities, knowledge and skills, and avoid any actions that might endanger the legitimate interests or property of ZETOR TRACTORS. ZETOR TRACTORS is a company with a long-standing tradition. Its name is wellknown to the general public and has become synonymous with the products manufactured by ZETOR TRACTORS. Employees shall uphold the Company’s reputation, and avoid any activities that could damage or put the Company’s reputation at risk. Employees shall keep confidential all information that employees come to know during their employment, and shall not disclose such to third parties, in order to protect the Company’s interests. ZETOR TRACTORS’s Code of Ethics is binding not only on employees, but compliance with the Code of Ethics shall also be required from the business partners of ZETOR TRACTORS. Following ZETOR TRACTORS’s Code of Ethics, a regulation implementing theCode of Ethics has been adopted to specify more detailed principles and rules for the compliance with and implementation of the Code of Ethics within ZETOR TRACTORS. In carrying out their job duties, ZETOR TRACTORS employees shall make all of their decisions to the benefit and in accordance with the best interests of ZETOR TRACTORS. In carrying out their jobs, employees shall not consider their personal interests or benefit to the detriment of the interests and benefit of ZETOR TRACTORS. No employee shall accept or give any gift or entertainment that may create or be construed as a future commitment to the donor of the gift or entertainment, considering common sense, local usage and practice. Employees, business partners and customers of ZETOR TRACTORS are given the opportunity to warn about unethical or fraudulent conduct via the channels established for that purpose. ZETOR TRACTORS acknowledges the importance of human potential, not only the potential in ZETOR TRACTORS employees, but also in ZETOR TRACTORS suppliers and customers. ZETOR TRACTORS and its employees are experts in their respective fields, and respect the legitimate interests and requirements of their business partners. Helpfulness and fair relationships are the core of business success. Suppliers are selected with utmost care to reach the maximum standard of product quality to the satisfaction of our customers. ZETOR TRACTORS holds the ČSN EN ISO 9001:2009 Certificate. To ensure compliance with legislative, internal and ethical standards, we give our customers, partners and employees the opportunity to draw attention to cases of unethical or fraudulent conduct. The notification should contain as much specific information as possible, including the names of the persons involved, witnesses and other possible sources of relevant information. Although direct reporting of unethical and fraudulent conduct is preferred, it can also be done anonymously. However, an anonymous notification may complicate or prevent a proper examination and investigation of the entire matter, and the acceptance of proper measures. All notifications will be deemed confidential. The reporting person will be guaranteed protection by ZETOR TRACTORS a.s. against any repression in connection with the submitted notification, and no manifestation of such behaviour will be tolerated. It is unacceptable to abuse this procedure to submit false notifications. Such behaviour will not be tolerated, and depending on the seriousness of such a false notification it may be referred to law enforcement authorities for further investigation. The originator of a non-anonymous notification will be notified of the investigation findings after the conclusion thereof.